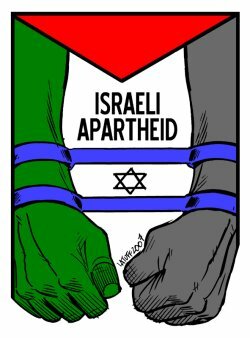 There is a growing realization that Israel faces a dilemma: either it withdraws to pre-1967 borders and maintains its Jewish Democratic nature, or it would turn into a "racist" "apartheid" state in the sense that Arabs in the "territories" do not get voting rights for a national parliament. But in fact this is false dilemma. It is perfectly legitimate for all Jews in Western Palestine, Judea, Samaria and Gaza included, to vote for an Israeli parliament and for Arabs in Judea, Samaria and Gaza to vote for an Arab parliament. This can be an Arab parliament of an existing Arab state. In particular Jordan's parliament is an appropriate option since Jordan extends on four fifths of Palestine: Eastern Palestine which was given to the Jewish National Home by the unanimous vote of all 51 nations of the League of Nations. Jewish national rights in Eastern Palestine (Jordan) were only postponed but not cancelled. Yet for peace Israel will be willing to make this concession. Alternatively the Arabs of the territories (Judea, Samaria, Gaza) can vote for an additional new Arab parliament of a new Arab state, for example, in Ramallah. A variation, or an option, of the above would include the Arabs of pre-1967 Israel who could vote too to such a parliament in Amman or to a new Arab parliament in Western Palestine. Thus even though all Arabs are members of one nation, and therefore deserve one state only by their own logic - and indeed historically, culturally, linguistically all experts agree they are one nation as they themselves have been saying for many years - and anomalously they have already 21 states whereas people like the Kurds do not have even one state and one parliament, still for peace Israel would be willing to make the concession of increasing the anomaly even further and consider yet another Arab state. Thus even though Arabs in America or Europe cannot express their national identity in an Arab parliament, Arabs in Western Palestine will be able to express their national identity in an Arab parliament, and simultaneously the settlement of Jews in all of Western Palestine could be encouraged so as to fulfill the requirement of international law, and to respond to the security requirement and to the necessity to settle Jews in the cradle of their civilization. In order to see the legitimacy and legality of this type of arrangement one should invoke the many precedents of similar arrangements. They all repose on the fact that one needs not have a territorial continuity between the territorial parts of a given nation state. Take for example Northern Ireland and the Republic of Ireland. These two territories share a common island. Yet their territorial proximity still allows for their belonging to completely different nation states. The people of Northern Ireland belong to the UK and vote for a parliament located in London in another island altogether. Nobody says that the British or Irish governments are implementing "apartheid" or a "racist" regime because the people of Northern Ireland do not vote to the proximate parliament in Dublin and are not part of the Republic of Ireland. Nobody says that the people of Northern Ireland do not enjoy national self-expression, just because they do not vote for the Irish parliament in Dublin which is their geographical proximate capital, or because they do not vote to a parliament of their own. This is just one example. The UK alone provides multiple examples of a nation whose parts are spread all over the world, albeit not all these parts are fully-fledged British like Northern Ireland; they may be British to varying degrees and enjoy certain autonomy. Thus, Gibraltar is British, and the British even fought in the other end of the world only recently in order to keep the "Britishness" of the Falkland Islands. To proponents of the dilemma above, these Islands should be Argentinean just because they are closer to Argentina. Alaska and Hawaii are not territorially contiguous with mainland US, yet they are part of the US. Spain has got territory in North Africa. Corsica is an island separated from the French mainland. In fact, it is closer to Italy than to the French mainland and yet it is part of France. The principle that one needs not have a geographical continuity or proximity between parts of a given nation is even demonstrated closer to home by recalling the status of Mount Scopus until 1967. This territory and all the buildings of the Hebrew University located on it were an official part of Israel. Yet it was encircled by Jordanian territory. Thus, the position that Israel can only be Jewish and democratic in the pre-1967 borders is false.